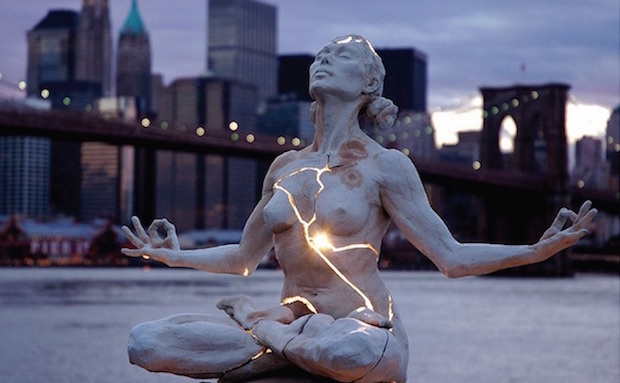 As you know, on occasion, I get personal with my readers when I feel there’s a broader metaphysical lesson to teach from a mystical experience that I had. There are times when the stars line up just right, veil between the worlds lifts and the mysterious world of the mystical makes itself visable in my life. This time the shift started last Friday night. I was sitting in the park with my friend, mentor and graphic designer, Christopher Gueluff. We were reading Tarot cards and suddenly, I looked up and realized I was staring straight at the scene from the 10 of Pentacles from the Goddess Tarot Deck. 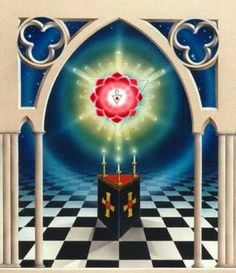 I joined the Rosicrucians in November but due to constant disruptions, I’ve never been able to make it to the Denver Temple. That changed on Sunday when I went to the Temple for my first Rosicrucian convocation. I felt things shift again as I was standing at the bus stop and a man with a dozen red roses, a red rose being a symbol of the Order, came and stood behind me in line. He sat behind me on the bus but didn’t get off at my stop. The bus passed a mural of sunflowers (a power symbol for me since I identify with the Queen of Wands) and I knew that I’d fallen into flow with the way things should be. When I got to the office park where the temple is, I was confused trying to find the Temple. I looked all over the vast rows of buildings and could not find the right unit. Then I saw what looked like a white dove fly overhead. I looked down and saw a young man and an old man going behind a corner. I decided to follow them and I ended up right where I needed to be. When I entered the atrium of the Temple, I was greeted with hugs like an old friend. 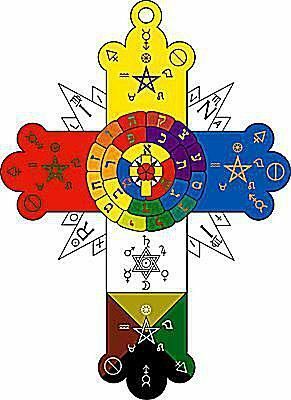 Without giving too many details because the Rosicrucians are a Mystical Order, I had a powerful experience during the mediation during ritual. The Grand Master had just talked about energy healing (which I am a big skeptic of) but I listened with an open mind. Then we had meditation. I had been fighting going into a trance during the entire ritual. It was the kind of trance that was so heavy that I felt like it would put me straight to sleep. But finally, I couldn’t fight it any more and gave in. Suddenly, I was on a bus. An agelessly beautiful woman with pretty, copper skin and beautiful, greenish, yellow eyes got on the bus behind me. She was short and kind of lanky. She had some clunky boots on and some kind of light blue lace dress with bell sleeves and all kinds of silver, jangling jewelry and trinkets hanging off her. She also had a silver nose ring with a chain that connected to her earring. Her chest length hair was very straight, shiny and dip dyed aqua. She was referring to healing. I understood she was asking me to open up to the spiritual healing to heal my depression. I started to cry and she held my hand. I felt tears slip down my face but remained in the world of the vision because it felt good holding Georgia’s hand. Her spindly, long fingers twisted together with mine and I let the overwhelming feeling of being in the presence of an angel consume me. After the ritual, we had a meal together and some of the fraters and sorors were talking about traveling. One of them lives the dream, traveling all over the world. I said I used to be able to travel but something happened and I can’t manifest things like I used to. “Where do you want to go?” The frater asked. After the meeting I spoke with another frater about how terribly behind I am on my studies. Since my finace left me, I’ve been too depressed to do anything. Even keeping Magdalena Tarot going has been a big struggle, but at the same time, it helps me find meaning in life. Thw frater told me that I need to get back to my studies and told me just to keep it up and don’t worry about how far behind I am. Just keep studying. I went home with every intention to print my materials (I learn best from printed resources) but I was out of paper. However, when I went to the store to buy some more on Tuesday night, the register was down so I got a whole box of paper for free. It’s usually $24. The manager said to look at it as a present. It certainly was. I printed my monographs, made a binder and put them in my bag to study at work since it’s been super slow. Yesterday, I was reading about visualization in my mystical studies at work. My text recommended the reader visualize all the colors of the rainbow. It went on to describe the vibrations of light and how rain splinters light and creates rainbows. It talked about the color black and how it absorbs light and how white reflects it. I thought of this beautiful, extremely dark skinned, African model and I wondered what her experience must be like absorbing so much light. She looks like how I envision the goddess: full of night. On the contrary, I’m really fair skinned. Sometimes I glow in the sun I’m so white. Even though my skin is pink, it’s such a light pink that it reflects light. I’m so sensitive to light that I have to hide under big hats and parasols and behind sunglasses or the sun burns my skin and eyes. I visualized myself full of light and refracting colors. Shortly after this, I had an unpleasant exchange with my ex. We’re wrapping up the last week and a half at the apartment and we’re getting rid of furniture. I had a mental breakdown because Adam (my ex) managed to get rid of all our furniture today which is good, but the futon I sleep on is going tomorrow which is bad because I have nothing to sleep on for the last week and a half at the old place. We had a terrible fight about furniture logistics that left me sobbing at my desk. I tried to cry secretly, keeping my head down, but it hurt so much I started to whimper. I noticed a rainbow in my tears splashed on my shirt. My boss caught me crying and told me to take a walk. At least it was the end of the day and I got to go home soon. I composed myself the best I could and came back. A light rain pelted me ad I walked to the bus stop. 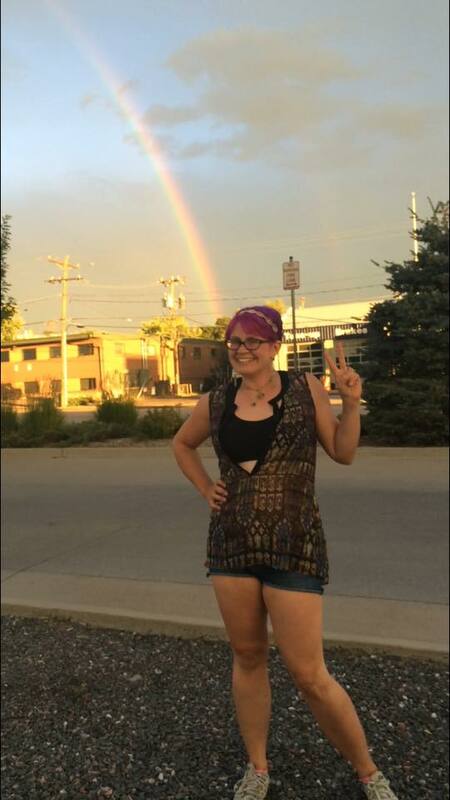 I turned around and a huge rainbow arched over the street. I remembered what I read and how I visualized a rainbow at my desk. And behold, one appeared over my work. And I wondered if my visualization acted as a vehical to bring it the rainbow into existence. I watched the rainbow through the grimy bus and train windows during my commute home, in awe at how it appeared just as my text said it could if my concentration was strong enough. I got off at the bus at the station. Almost a year ago today I was heartbroken over a man I shouldn’t have loved. Today I am heart broken over the man I should have given that love to. And sure enough, the rainbow appeared right in almost the exact same place it was in a year ago. 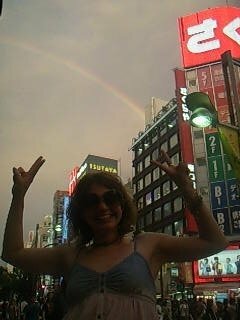 And although I live in Denver now, almost 7 years ago to the date I was broken hearted and a rainbow appeared over Tokyo, where I was living at the time. Something about the end of cusp of Leo brings rainbows to me when my heart is too broken and I think I can’t go on. I guess my tears refract light. And Every time I blink my eyes now, I see that rainbow burnt into my eyelids like metaphysical reading said would happen. It said that if you stare at a color, the complementary color will appear when you close your eyes. I also realized that the forecast lined up with today as well. 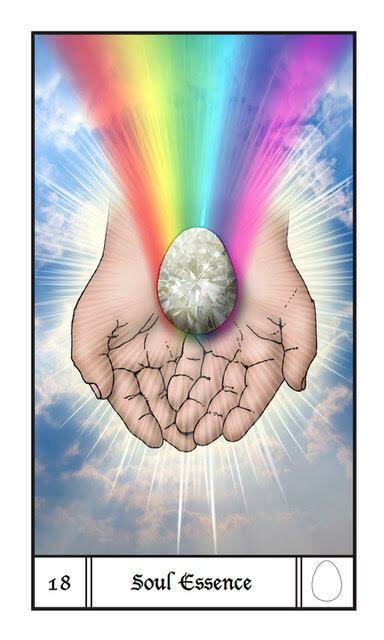 The Soul Essence card is a card that was added to the Tarot by the creator of this deck, Richard Hartnett. This is a card that brings events that help you connect with the deepest parts of your soul and answer questions like, “What’s my life purpose?” If you feel less than harmonious, ask yourself why. Mercury Trine Saturn at 12:16 PM PST is a transit that brings serious thoughts and feelings to the surface. It’s time to get organized. Moon square Neptune at 11:19 PM PST is a transit of fantasies and illusions. If you are seeking answers you may find them in the mystical. The Moon is in the dual sign of #Gemini today asking you to unite both your dark and light sides to find balance. The number of the day is 9, a number of near completion.